Craig Lambert is an experienced public speaker who is available for engagements at corporations, associations. nonprofits, and educational venues. He brings a witty, lively style to the podium, combining humor with stimulating ideas. Craig offers two programs, both of which include photographs and illustrations. The first, “Shadow Work,” explains and illustrates the emerging socio-economic phenomenon that his book of that title describes. See the SHADOW WORK page of this website for details on the book as well as reviews and media coverage. The second program, “How Harvard Changed Comedy,” describes, with abundant examples, the impact that comedy writers and performers trained at the Harvard Lampoon have had on American humor over the past century. It focuses on the decades since the founding of National Lampoon magazine by three Harvard alumni in 1970. Craig takes the audience behind the scenes at Saturday Night Live, Animal House, Caddyshack, David Letterman, The Simpsons, and many other radio and TV comedies; he touches on performers including Conan O’Brien, Al Franken, Fred Gwynne, George Plimpton, Patricia Marx, and Andy Borowitz. 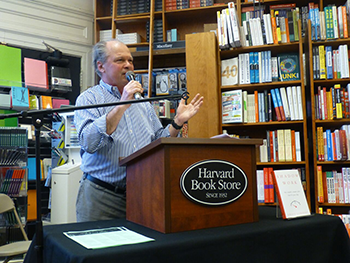 Audio recording of Craig Lambert speaking on Shadow Work at Harvard Book Store in Cambridge, Massachusetts, May 12, 2015.